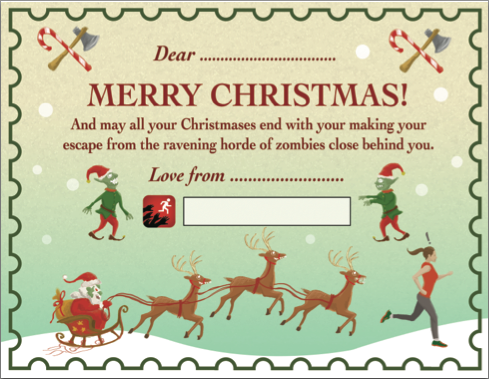 Give the Gift (Certificate) of Zombies, Run! – Zombies, Run! Give the Gift (Certificate) of Zombies, Run! Like the ravening undead hordes, the holiday season is once again rapidly approaching. A time for coming together with your loved ones, decapitating those of you who have already gone grey and giving lovely presents to the rest. The problem being, of course, that most presents are replete with issues that make them basically useless and terrible. Go over to the iTunes App Store and buy a gift code for your favourite Zombie-themed running app. Unfortunately, Google Play don’t let you gift apps so this step’s just for iOS users. Download our gift certificate – it’s free! Deliver the love like a postal worker on Valentine’s Day. It could not be easier. Well, it could be but we can’t do everything for you. Previous Post 7 Minute Superhero Workout Now on Android – plus 40% off! Next Post Step Buy Step Out Now on iPhone!